Kinjo Japanese Restaurant goes beyond standards of ordinary food and breaks the mold of traditional Japanese cuisine.Our venue contains a full dining room, hibachi tables, sushi bar, and full bar to suit any party needs. Established in the summer of 2016, Kinjo Japanese Restaurant has been a staple of Asian Cuisine in the capital region. Diners in the open yet modern decor dining room are treated to dishes that reflect the aesthetics of the world using natural ingredients to reflect a fusion of Japanese Cuisine. 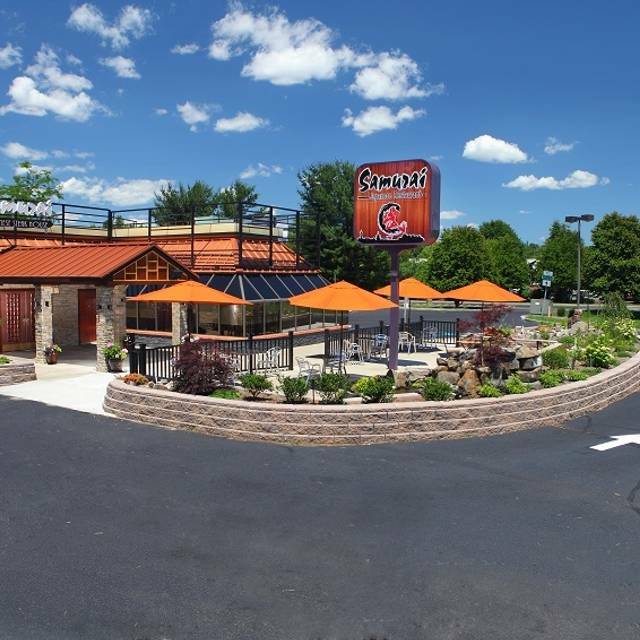 For a true dining experience, family fun and social gatherings, come enjoy our showstopping Hibachi. Hibachi chefs entertain our patrons while cooking, prepared and presented with great flair to complement its flavor. Also let our remarkably skilled sushi chefs create an artistic platter from one of the area's freshest selection of fish. All needs can be catered to. Please just call ahead and make an order with the manager. Full parking on both sides and back- three entry and exit ways. Public transit is right across the street (bus). Also accessible by hotel shuttle and taxi. This is the second time we've dined at Kinjo. Both times were fantastic. The sushi is excellent and fresh as well as the specialty rolls. The cocktails are unique and innovative. Above all, the service is outstanding. The staff is friendly and willing to offer suggestions and answer any questions you might have regarding the menu. Very attentive and accommodating. Very tasty and creative food. Went for New Years Eve and had a great meal. Kinjo is a great experience and meal. The fish is always fresh and the ambiance is wonderful. The rolls are huge and the presentation blows other sushi places in the area out of the water. I have not been for happy hour but have heard wonderful things. Service was very quick, even on one of the busiest nights of the year (New Years Eve). About 15 minutes from ordering to the time food hit the table. It was our second visit! We loved it ! We have been there several times. Brought some new neighbors and they loved it too.Enjoyed the food and the surroundings. A little noisy from the Hibachi tables who were obviously enjoying themselves. The hibachi was great and the show was very entertaining! The restaurant is beautiful great atmosphere! We will be back. We had hibachi, but even with a reservation we had to wait an hour for our dinner. It was very busy. Excellent sushi and really good service. My family and visiting friends thoroughly enjoyed our visit. The staff was very friendly and the food was terrific. Excellent tempura. Food was expertly prepared. Beautifully remodeled, ample parking and most importantly, sushi was fresh and delicious! Yakitori was tender and excellent and the tempura was crunchy and mot greasy. Really great place for lunch or dinner! The food here was great... The sushi and sashimi were excellent. Also enjoyed the appetizers. I definitely recommend this place. We dined at the bar and the service from Kevin the bartender was phenomenal, I will be returning to Saratoga again from Rochester during Travers Stakes at the Race Course and will definitely be back for some more Sushi. Hopefully Kevin will be working again! Food was great and service very good. Highly recommend for families or a fun night out. A great addition to the Saratoga restaurant scene. RUN! Do not walk! Get to KinJo Restaurant in the CVS Plaza Saratoga Springs for an awesome meal as soon as you can!The three of us were greeted by the hostess and owner when we arrived and seated at a nice window table. Our drink orders were taken and we were handed a HUGE menu with several pages of sushi selections as well as regular Japanese dishes. We were given ample time to select and the server was very helpful with suggestions. Two of us ordered sushi (which we traded among ourselves). The presentation was very appealing and the food was very fresh and tasty. One of of us ordered a "Dream Box" which consisted of Miso soup, shrimp tempura, lobster shumai, 6 California rolls and vegetable tempura - a feast! Right after we arrived, a fierce lightning storm erupted, causing the power to go out twice but it came right back on. This did not bother the staff at all. The service was attentive and not obtrusive. KinJo also has a room with hibachi tables where guests were treated to a lively show of food prep. We will definitely go again when we visit Saratoga. Very entertaining at the Hibachi table. A lot of laughs, great food! I recommend! We come to Albany for the Saratoga races, so we'll be back here next year for sure. I just finished my leftovers and I'm sorry they're done. Scrumptious is all I can say. See y'all in 2016. We have eaten at Samurai several times previous to this visit and have found it to be satisfactory. Now it is just okay. We did table service, as opposed to the Hibachi tables, and the food served was less than hot, from a wait staff that seemed distracted and disinterested in providing service. We will probably not return. This was our first visit to Samurai. We frequent a number of Japanese/Asian restaurants. The sushi and kitchen appetizers were great as were the cocktails. We enjoyed the service and friendly atmosphere. The menu has a very nice selection of items including a prix fixe menu that we intend to take advantage of on our next visit.